What is smarter travel @ work? Smarter travel @ work program supports businesses to adopt safer, greener and more active travel options for both business and commute travel. There is no cost to a workplace to participate in the program. Hover your mouse over the steps below to see more information on each process step. DPTI and the workplace meet to discuss interest in participating. If the workplace is interested, DPTI will write to the workplace. The workplace confirms their 'expression of interest' by signing and returning the letter from DPTI. By signing the letter the workplace agrees to be an active participant in smarter travel @ work and to implement suitable travel initiatives identified though the DPTI survey. DPTI provides a survey template, which is distributed electronically to staff at an agreed time. If electronic distribution is not suitable other options are available and will be discussed. DPTI collates the survey results and presents the key findings back to the workplace. This includes recommendations on initiatives that are likely to be successful. The workplace then determines which initiatives to deliver. DPTI can assist in scoping, costing and refining initiatives. The workplace identifies human resources and budget required to implement initiatives. The workplace can access additional resources to support them through the process of surveying staff and implementing actions. Networking opportunities are also available to participating workplaces. Participating workplaces can apply for a grant through the Department's Community Grants Program. Go to the Grants page http://www.dpti.sa.gov.au/communityprograms/community_grants for more information on the application process, ideas from previous recipients and how to apply for the next round. The workplace has been successful and wishes to continue with the program. Following the second survey the workplace may decide they wish to continue to deliver initiatives to achieve safer, greener or more active travel. The survey results along with other evidence can be used to identify further opportunities. The workplace continues to participate with less need for DPTI support. What are the benefits of participating in the smarter travel @ work program? How do I become involved in the smarter travel @ work program? To get involved contact us at DPTI.TravelSmartSA@sa.gov.au. We will then get in touch to discuss the process and how your organisation might benefit from smarter travel @ work. Interested workplaces will then need to confirm the support of management. As soon as we have this, we will get to work organising your staff survey. How do I know that the smarter travel @ work program will be a good fit for my workplace? smarter travel @ work is designed to meet the particular needs of the individual workplace. We survey your staff and profile your workplace and only recommend initiatives that we think will work at your workplace. Your organisation then decides what changes/ideas to implement. To what do workplaces need to commit? 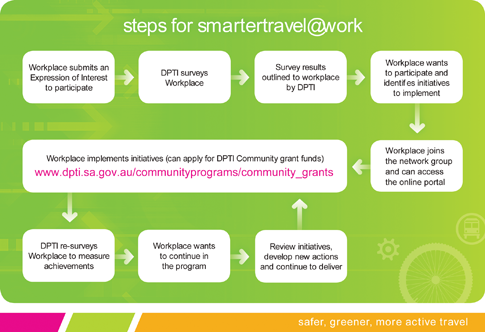 To be eligible to participate in the smarter travel @ work program, workplaces need to return an expression of interest signed by a senior manager to confirm management support. This commits the workplace to undertaking a staff travel survey, based on which we will recommend initiatives for the workplace to consider. The workplace can then choose to implement one or more of these initiatives over a period of 12 to 18 months, after which we will re-survey the workplace to evaluate the success of these initiatives. On average, how much HR time will I need to allocate towards undertaking initiatives? How much time you need to devote to the smarter travel @ work program will depend on what initiatives and actions your workplace undertakes. Many initiatives, for example publishing intranet guides identifying available transport options, require some work upfront and then require minimal review. Some initiatives such as a carpooling program, may involve long term human resourcing. What you take on, is up to you. A proportion of the work will be carried out by DPTI. This includes surveying, evaluating, reporting and providing advice on delivering initiatives. DPTI works in partnership with Councils to deliver travel behaviour change programs across the State. attend meetings with DPTI to visit workplaces. access to grants for councils and workplaces.